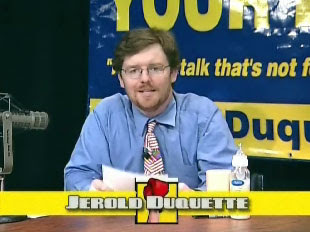 There is a new bi-weekly TV show called Put Up Your Duqs on Longmeadow Community TV. It is hosted by Jerold Duquette- the once controversial School Committee member, now prime time political commentator on LCTV. The first airing on LCTV is Monday, June 30 at 6:30 PM (with a replay on Wednesday, July 2 at 6:30 PM). If you prefer watching the show at your convenience and have high speed Internet, I would recommend the Web broadcast which is already available on the Put Up Your Duqs blog. The quality is quite good. I've watched the first episode and found the show to be quite entertaining and educational. Professor Duquette and his new TV/ Internet venue promises to open much needed dialog in our town. There are plans to invite a local guest every week to discuss important issues of the day. I suspect that this show will become very popular and greatly increase the TV ratings of LCTV. P.S. While his invited guest this week did have much to say, he was the hit of the show! Storrs Library, old but also new! It is hard to believe that the addition to Storrs Library is already more than 16 years old!! Those of us who were here at that time remember how cutting-edge the design seemed, featuring a centralized circulation desk, a separate Reference Desk, areas for computerized catalogs, a children’s room on the main level and an elevator to the second floor. Little did we imagine that sixteen years later, we would have seven public access catalogs, eleven Internet stations, plus wireless capacity throughout the building. Our fiction and nonfiction collections have continued to grow, adding new titles to those already on the shelves and creating a depth and range difficult to find in bookstores oriented to stocking only the latest publications. In 1997, five years after the opening of our addition, we timidly launched our first web presence at http://www.longmeadow.org. Back then we had a few sections—a very basic computerized catalog, sections on library history and policies and a Web gateway with some favorite links. Eleven years later, how things have changed! We are now at www.longmeadow.org/library with a newly designed enhanced library catalog. With a Storrs Library card not only can you search Longmeadow’s holdings from home, expand your search to all Massachusetts libraries and place online requests, but you can read summaries and reviews of most titles right from the catalog. High-quality reference databases include searchable, general interest periodicals, full-text, peer-reviewed academic and professional journals and newspaper backfiles such as the New York Times, the Boston Globe and the Springfield Republican. The website provides access to full-length downloadable videos, like the Globe Trekker videos and hundreds of audiobooks that can be downloaded and played on portable devices. One of the databases, Academic Onefile, has free downloadable podcasts from NPR and the New England Journal of Medicine. Issues and Controversies and Issues and Controversies in American History contain excellent resources for students working on contemporary issues, while Science Online provides support to the middle and high school science curricula. Wild Things are happening at the Storrs Library this summer. The summer reading program, part of the statewide Reads In Massachusetts program, offers kids, teens and adults the opportunity to explore the joy of reading. Parents who participate will show their children that reading is fun for everyone. The program runs from June 23 through August 8, 2008. Readers can join anytime during the program. For more information stop by the Library or visit us online.